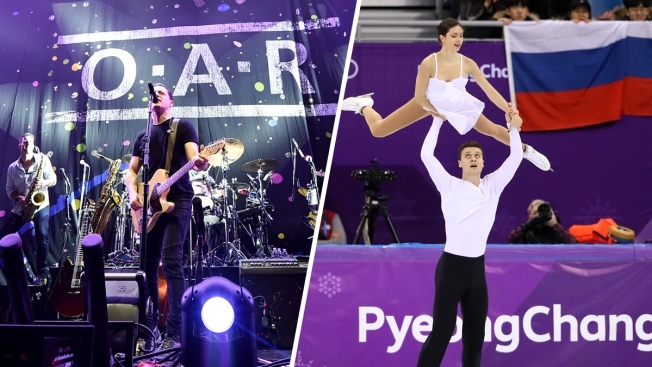 Rock band O.A.R., left, is seeing a resurgence in hits after confused 2018 Winter Olympics fans flocked to Google for an explanation on the new designation for Russian athletes competing in Pyeongchang. The Olympic Athletes from Russia (OAR) designation came about as part of the IOC's sanctions against Russian doping at the 2014 Sochi games. The Winter Olympics can make for strange bedfellows. Just ask the members of Maryland-based rock band O.A.R (Of A Revolution), who've found themselves on the tips of many tongues far from South Korea thanks in large part to the Olympic Athletes from Russia... a.k.a. OAR. In an interview conducted by ESPN, O.A.R's lead singer Marc Roberge said the connection has been "surreal," although not altogether unexpected. "At first I thought it would be a cool coincidence, maybe somebody would mention it on TV or something. But now, every single morning I'm getting phone calls, emails, text messages. Family, friends, strangers. It's pretty wild to think somebody is watching the Olympics and thinking about us." Made the same mental connection between OAR of #Olympics and O.A.R. the band over the weekend, during the few minutes of games I've watched. Nice example of the power of triggers. Glad O.A.R. the band is finally getting some name recognition, even if it's a joke. Greatest band in the world!! "We always wanted it to be this mystery," Roberge told ESPN. "As a kid, you have all these dreams of being Led Zeppelin, and that's what we came up with. Just some kids in the basement in high school. Now with all this, talk about a coincidence."